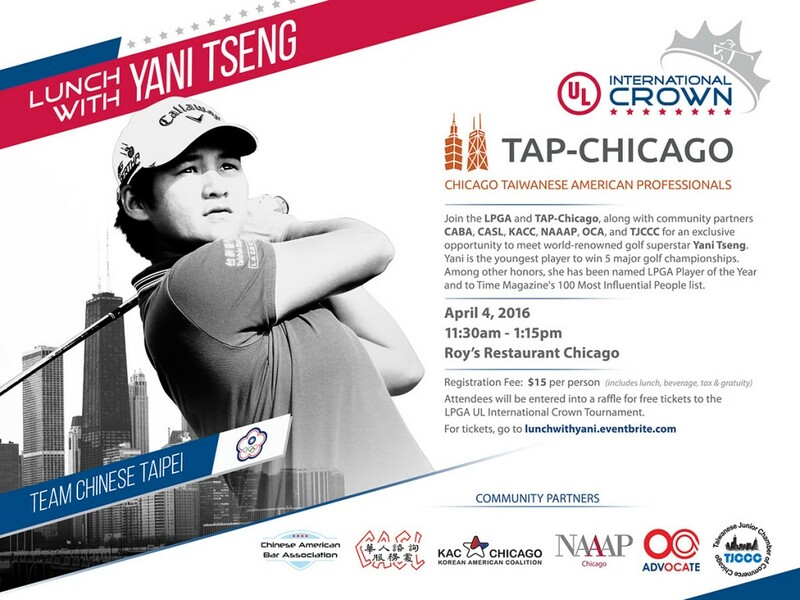 Join the LPGA and TAP-Chicago along with community partners CABA, CASL, KACC, NAAAP-Chicago, and TJCCC for an exclusive opportunity to meet world-renowned golf superstar Yani Tseng on April 4th at delicious Roy’s Restaurant in downtown Chicago. Yani is the youngest player to win five major golf championships, has 27 professional tournament wins, and was ranked #1 in the world from 2011 to 2013. Come for this once-in-a-lifetime opportunity to speak with and learn how to play golf from Yani. You will enjoy an amazing lunch catered by Roy’s and have the chance to win free tickets to the UL International Crown Tournament at the Merit Club in Gurnee, IL from July 21st to July 24th. Register now! Limited space available for this great opportunity to meet and celebrate with a true Asian American superstar athlete. The 2016 UL International Tournament will showcase eight teams, each composed of the four highest ranked players drawn from eight qualifying countries determined at the conclusion of the 2016 ANA Inspiration and the KPMG Women’s PGA Championship. The purse is $1,600,000. Come watch as top-ranked South Korea battles second-ranked USA, third-ranked Japan, and fourth-ranked Chinese Taipei (Taiwan)! The Merit Club is ranked among the top 100 golf courses in the United States by Golfweek and Golf Magazine and previously hosted the 2000 U.S. Women’s Open. For more information, please visithttp://www.ulcrown.com/. Any questions? Please contact Richard Hu at richard@tapchicago.org or Sabena Auyeung at sabena@tapchicago.org. Post in Athletics, Past Events, Professional and Leadership Development | permalink.